Arsenal had the better start to the game and were able to control most of the first half. They started in a 4-2-3-1 shape, but began in an asymmetric structure in build-up play. Left-back Mitchell stayed deep while right-back Evans slightly moved up the pitch. With these different movements of the full-backs, Arsenal created a back three that was a little bit shifted towards the left side. The goal of this back three was to be able to have a more stable circulation of the ball and make the pressing of City’s 4-1-4-1 more difficult. The deep positioning of Mitchell was problematic for City’s right-sided midfielder, Nikita Parris. She had a much longer way towards the full-back to press her, which became exhausting and enabled Arsenal to easily open the passing lanes towards Little or Nobbs. With the asymmetric build-up play, Arsenal’s structure in the first minutes of the game was mostly a 3-2-4-1 or 3-4-2-1. On the right side, Evans gave width while Mead moved into the half-space. On the opposite side, Little stayed on the wing, although higher positioned than Evans, and Nobbs moved into the left half-space. 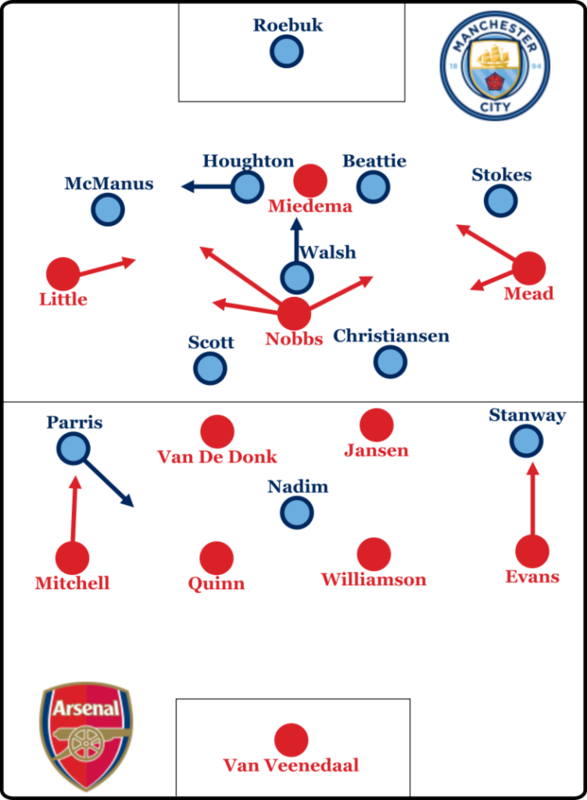 With this formation, Arsenal did not only manage to have a stable circulation at the back but also occupied the spaces next to City’s holding midfielder Walsh as well. Arsenal’s asymmetric 3-4-2-1. Parris has to go a long way to press Mitchell. If she starts too early, the passing lane towards Little is open. After a good start into the game, Arsenal became more offensive and pushed Mitchell a bit higher up the pitch, building up with only the two centre-backs and the two defensive midfielders in front of them. The formation became a customary 4-2-3-1, with the defensive midfielders staggering their positioning so that one ended up coming towards the centre-backs while the other one staying higher. City’s 4-1-4-1 basically mirrored the 4-2-3-1, which allowed them to be very man-oriented in midfield, while having to press with one striker against the two centre-backs. A situation that Cushing’s side usually like. In their pressing, they often allowed the centre-backs to have time on the ball, but man-mark opponents in the midfield. This led to passes into the midfield and direct passes back to the defenders, as the midfielders were unable to turn with an opponent behind their backs (especially unpleasant if you have 1.81m tall Jill Scott behind you). These backwards passes triggered the pressing and the midfielders moved quickly forward to put high pressure on the defenders. 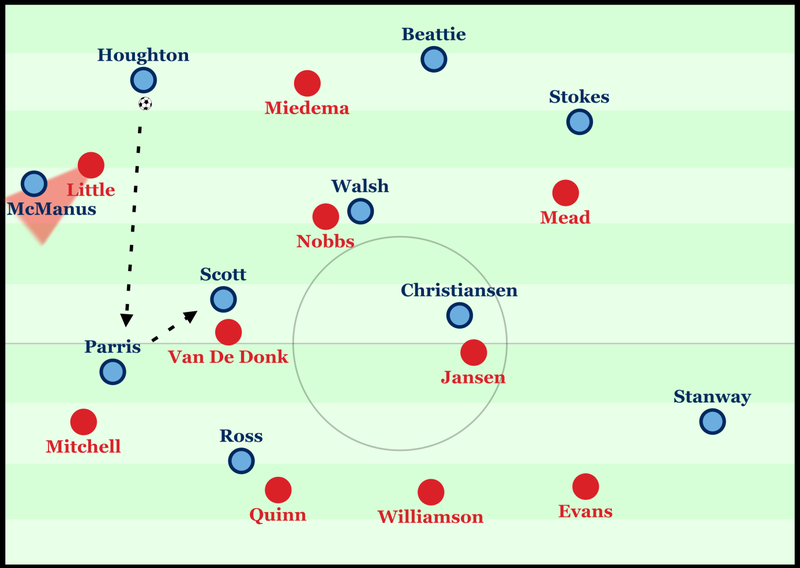 When receiving the ball, Jansen and Van de Donk were, in most situations, closely marked by Scott and Christiansen, but the Dutch duo showed great pressing resistance. Physically strong, with good orientation and technically sound, they were able to control the ball and find suitable solutions to those situations, e.g. passes forward into the midfield or more often towards the full-backs. Only on rare occasions, they lost the ball in their own half. Because of the quality of Jansen and Van de Donk, City’s midfield could not gamble on passes back to the centre-backs as this could have led to gaps in the midfield, which the two defensive midfielders might have exploited. Furthermore, Quinn and Williamson had time to step back and give more depth, to have more time on the ball after passes went back to them. As the first half progressed, Nadim struggled to put enough pressure on the centre-backs. She didn’t do well in the beginning, but with the use of passing triangles between Quinn, one of the defensive midfielders and Williamson, Nadim was usually late. Quinn and Williamson, therefore, got time to choose their passes well and to dribble a bit forward into the midfield, which was protected by a defensive midfielder stepping back. The centre-back duo showed decent passing quality and regularly brought the ball into the half-space, where Little, Nobbs or Mead could receive. On the ball-near side, the winger always moved into the half-space, but the structure on the left and right side was a bit different. The right side was simpler, with a triangle between full-back, winger and defensive midfielder. On the left side, Nobbs often overloaded the wing and targeted gaps within the back four with runs behind the line. 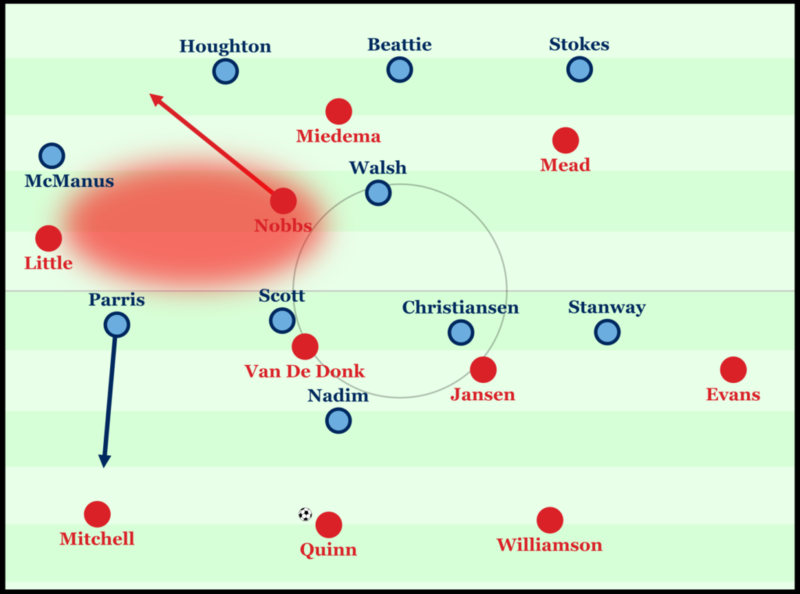 As McManus pushed forward to press either Little or Mitchell, Nobbs attacked the space between the full-back and centre-back, although this didn’t lead to any dangerous situations. Nobbs was more important when she got away from Walsh and found space between the lines, as City’s defensive midfielder didn’t want to move far away from the centre. Arsenal were able to break through on the wings a few times, but still struggled to create really dangerous situations as Miedema was controlled very well by Houghton and Beattie. Still, Miedema managed to score after receiving an unlucky clearance from Beattie. On the other side, City couldn’t show their high individual quality often, played an overall disappointing first half and didn’t create any good chances. With the 1-0 lead shortly after the first half, Arsenal started to focus more on quick counterattacks instead of trying to keep the ball. Those counterattacks were not quite successful as City counter-pressed them well, with their rest-defence also doing a good job. As Arsenal’s focus in possession and transition changed, and City’s intensity drastically increased, Nick Cushing’s team got more and more control over the game. The decision to bring on Jane Ross at half-time for Nadim was ever more helpful. Little is cutting the passing lane to the full-back. Houghton can play a vertical pass to Parris, who would then turn between the lines or lay off to Scott. Alternatively Houghton played diagonal passes towards Stanway. The centre-back pairing of Houghton and Beattie became more dominant and tried to enhance the possession play. Beattie did so by dribbling forward into the space next to Miedema more often, and Houghton by playing more vertical and diagonal passes. Houghton also moved frequently to the right in order to create more space against Arsenal’s pressing, whereas Walsh positioned herself deeper to control the gap left by her. With her gifted right foot, Houghton could play some fine diagonal long balls to the left side, while Arsenal were shifted to the right side because of Houghton’s positioning. But more importantly, Houghton managed to exploit the gap in the half-space left by the Gunners. These gaps were opened because Arsenal’s outside midfielders tried to close down the passing lanes between centre-back and full-back in order to limit City’s attacks on the wing. But the central midfielder often didn’t shift enough to block the half-space. With Houghton’s decent passing quality, even the small gaps could be exploited and, in the second half, she regularly found Parris. The vertical passes of the defenders were mostly followed by direct lay-offs to the No. 8s, which were then able to receive in an open position. But as the vertical passes got also followed up by backwards pressing applied by Arsenal’s midfielders, City could not often get into the space between the lines with their vertical passes and lay-offs. Arsenal adjusted their pressing to a 4-4-2, but lacked vertical compactness and left too much space in between the lines. Still, City couldn’t exploit this enough. They started their attacks on the wings and didn’t bring the ball into the centre often enough. Therefore, they didn’t have many options, and Arsenal were still able to put enough pressure on them in order to limit City’s attacks to long-range shots and crosses. Overall, it was a close game and, considering the second half, a lucky win for Arsenal. Arsenal showed an interesting approach throughout the first half with a good build-up play, especially with the Dutch duo Jansen and Van De Donk. Man City dominated the second 45 minutes but overall struggled to utilise their usual mechanisms which then led to them not creating enough dangerous situations to score the equaliser. AB (@AlexBelinger) is a writer for Spielverlagerung.de.